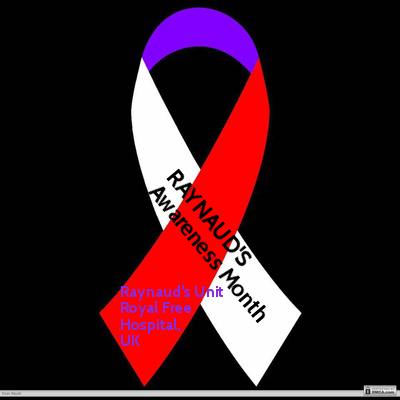 October is Raynaud’s Awareness Month. 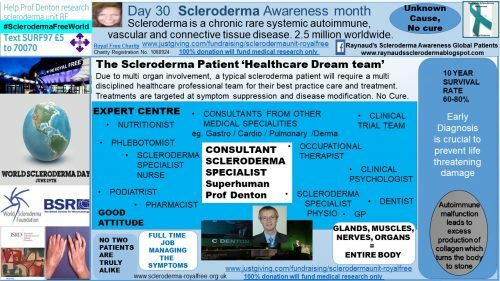 It is also the month when the beautiful autumnal shades over here in the U.K. remind me that my winter “full-time hibernation” is looming. 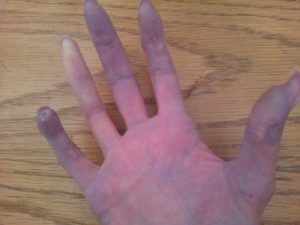 My 50 shades of blue “party trick,” where my hands and feet change color at the slightest temperature decrease, is extremely difficult to control at this time of year. 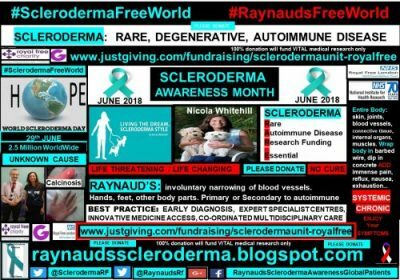 I have detailed my Raynaud’s challenges, highlighting the immense impact this diagnosis has on my life, combined with the full-time job of managing scleroderma symptoms. My “Tin Man” body, along with fatigue and mobility challenges, remain constant sources of frustration. 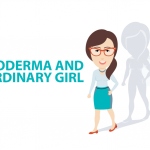 “Ah great, another day to spend in bed” is not my favorite mantra. 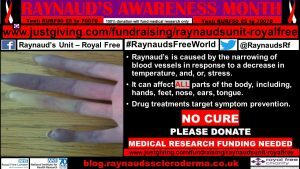 People kindly say, “But you look so well.” But the reality is Raynaud’s symptoms keep me under “house arrest” year-round. 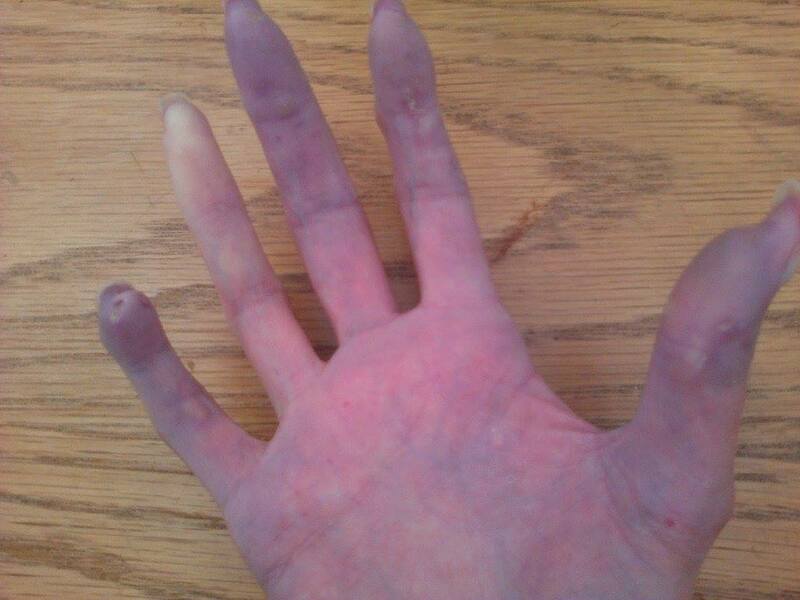 My Raynaud’s sensitivity is so severe that an attack can be induced by me just moving from one room to another — indoors! 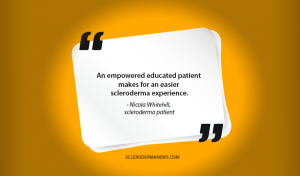 Therefore, my symptoms are easiest managed by avoiding any temperature change. 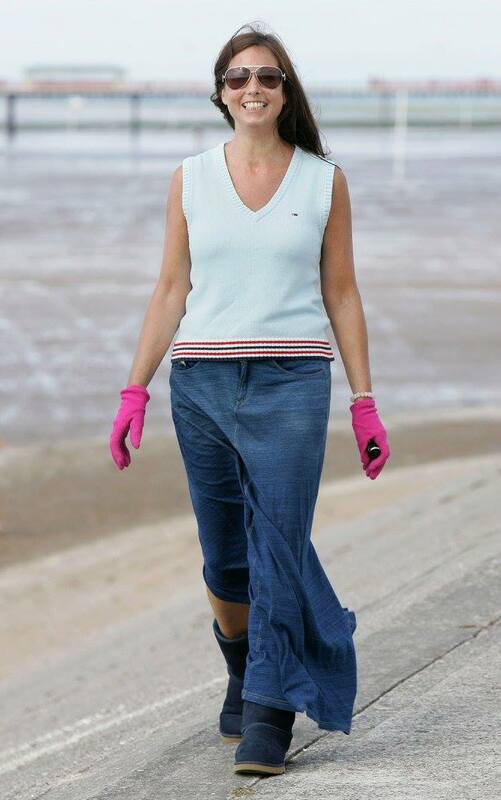 My inner “Bond Girl” absconded years ago, leaving me wearing Ugg boots and gloves, even in the summer. 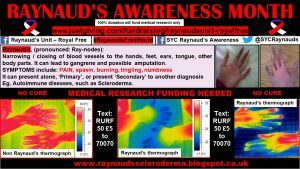 There is currently no cure for Raynaud’s, and prescription medications create blood pressure-altering, unpleasant, side effects. 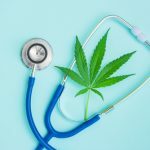 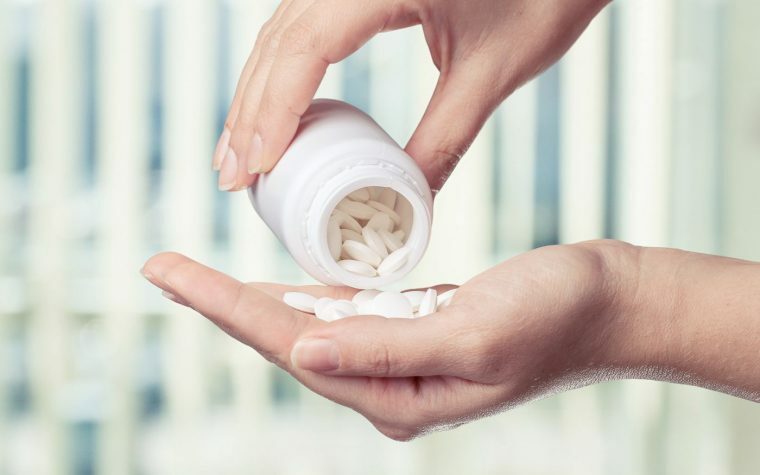 I no longer experience as many digital ulcers and the intense, excruciating pain which comes with them, since taking bosentan (125 mg) twice a day. 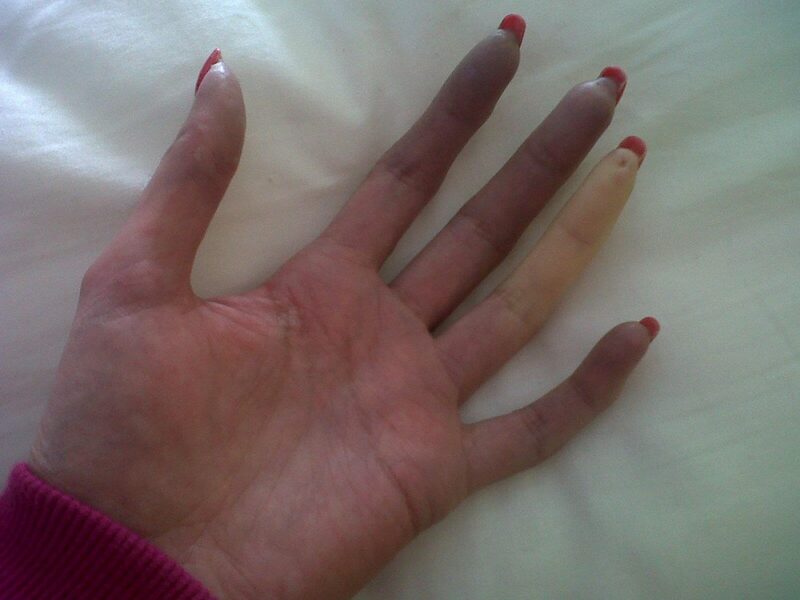 A trailblazer, Dr. Kevin Howell at the Royal Free Hospital, has kindly shared a video explaining the science behind what happens during a Raynaud’s episode. 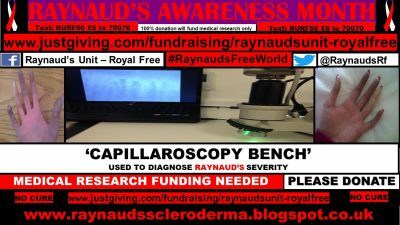 Nailfold capillaroscopy is a diagnostic test used to identify possible blood vessel damage, which can indicate a possible underlying autoimmune condition. The nailfold capillaroscopy equipment costs around £1,500. 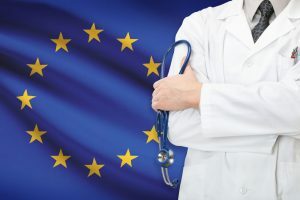 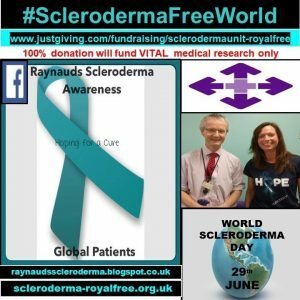 Without a shadow of a doubt, the entire global Raynaud’s community is eternally grateful to Dr. Howell for his dedication and commitment to the Raynaud’s enigma over the course of his career within the U.K.’s National Health Service (NHS). 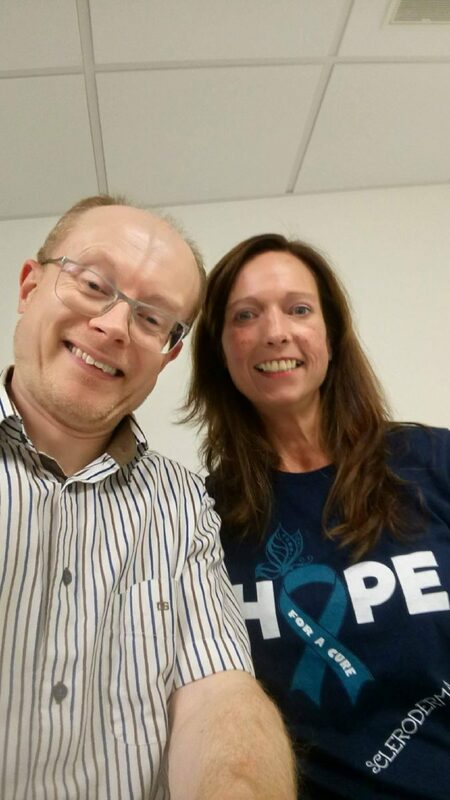 He is currently celebrating his 26th year in the NHS. 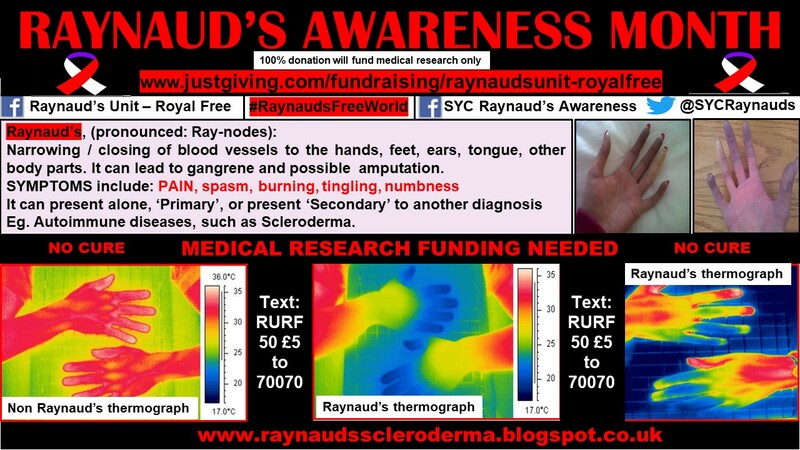 Many congratulations and thank you, Dr. Howell, the global Raynaud’s trailblazer. 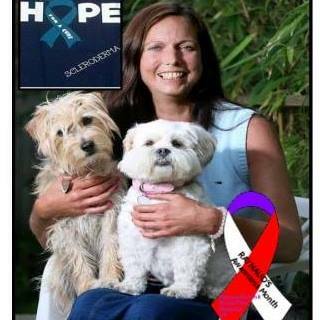 October is a very busy month for our community, providing lots of awareness platform opportunities. 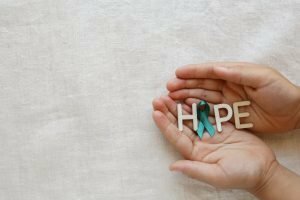 Invisible Disabilities Week takes place from Oct. 14 to 20. Oct. 12 is the anniversary of the passing of a late scleroderma and Raynaud’s trailblazer, Anne Mawdsley. I am eternally grateful for Anne’s friendship and all she has done to give our community a voice over the last few decades. 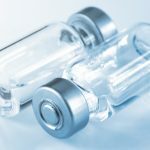 Anne’s contribution was recognized within a poster, “Optimizing Scleroderma Centers of Excellence: Perspectives from Patients and Systemic Sclerosis (SSc) Experts,” presented at the 2016 Systemic Sclerosis World Congress held in Lisbon. 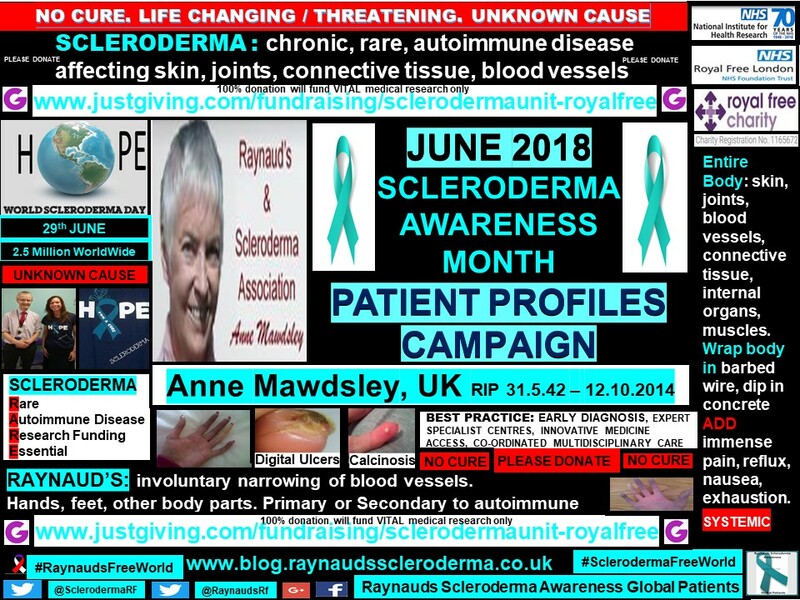 An acknowledgment was “dedicated to the memory of Anne, founder of the Raynaud’s and Scleroderma Association U.K., who raised over 10 million pounds for SSc research, education and advocacy in her lifetime.” The poster is found in the Journal of Scleroderma and Related Disorders. 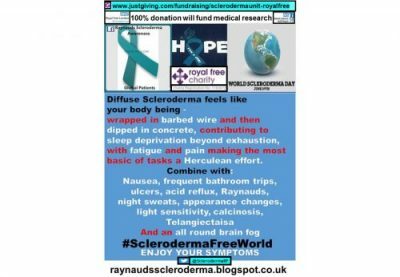 During my global patient profiles campaign for Scleroderma Awareness Month 2017 and 2018, every patient detailed how Raynaud’s and digital ulcers were a continual problem. 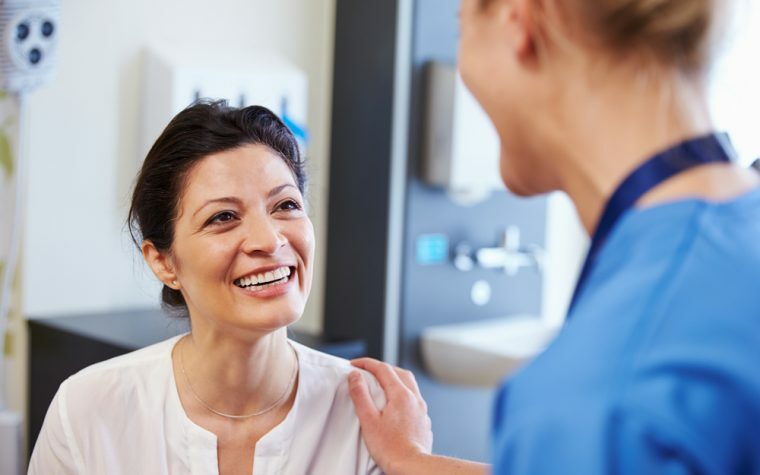 I am honored to be a patient research ambassador with the National Institute for Health Research. 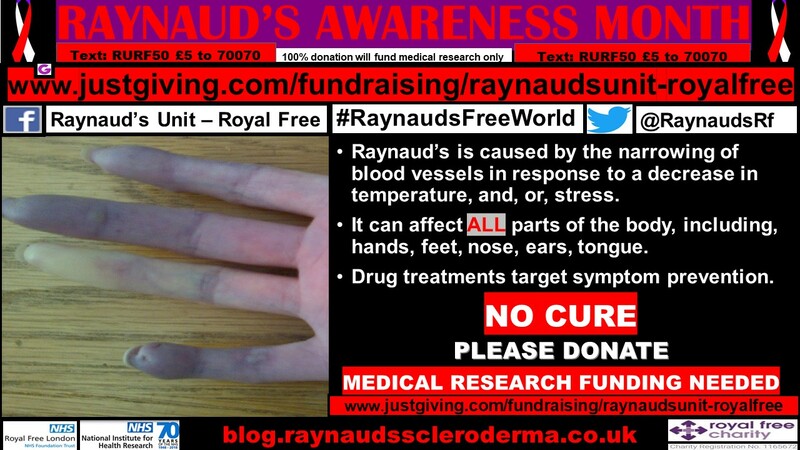 Please donate to help fund medical research at the Raynaud’s Unit in The Royal Free Hospital, London. 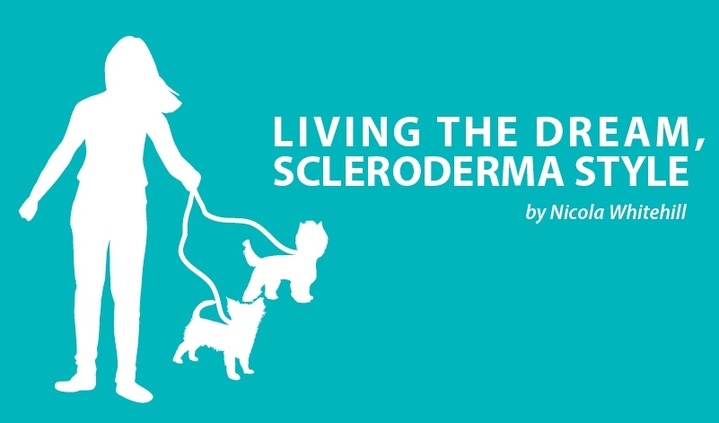 Click here to donate to the Scleroderma Unit. Tagged Anne Mawdsley, bosentan (Tracleer), invisible disability, medical research, Raynaud's Awareness Month, Raynauds unit, The Royal Free Hospital, vasospasm.